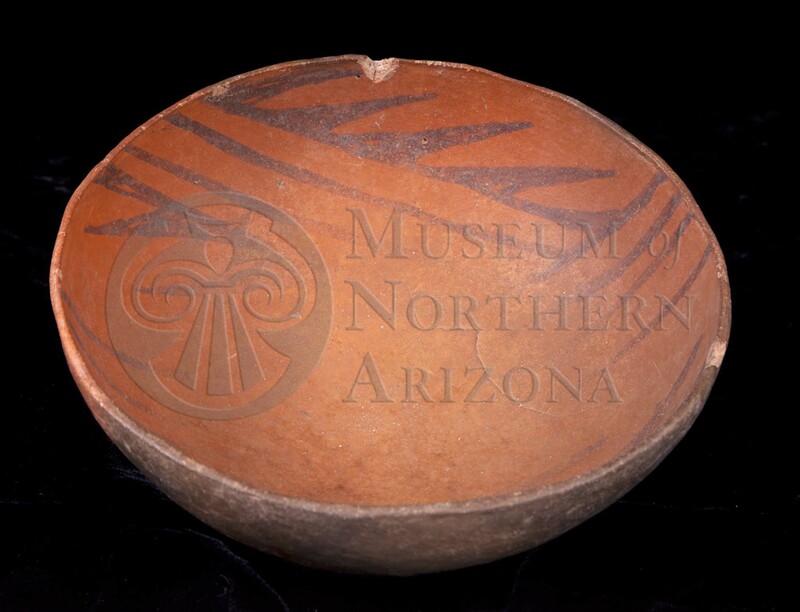 Bluff Black-on-red bowl from the Museum of Northern Arizona collections. Click the image to open the Bluff Black-on-red gallery. Bluff Black-on-red, a type of San Juan Red Ware, is found in the San Juan River drainage in the Four Corners area and up Chinle Creek to Water Fall Pueblo, Nokito, Arizona. As a trade ware, this type is found sporadically westward to Nokai Canyon, Navajo County, Arizona. Core Color: Dark gray through pink to brick-red. Temper: Predominantly coarse angular quartz sand, lesser amount light-colored angular fragments (crushed rock? ); generally few grains of basalt sand; occasionally crushed rock, pinkish; temper generally conspicuous in cross-section of reddish color; not conspicuous on surfaces; glittering specks of white or sometimes yellow (pyrite?) noticeable on the surface. Surface Finish: Bowls generally bumpy, well-polished, crazed; polishing marks, horizontal, inconspicuous; exterior surface, generally pitted; both surfaces bowls and exterior surfaces of jars, impacted. Surface Color: Reddish; color of the surface and core do not contrast when the core color is reddish. Forms: Bowls, jars, dippers(uncommon), seed-jars, pitchers. Vessel Thickness: 2.8 mm average (bowls); 3 mm average (seed jars); 4.5 mm average thickness (jars). Paint: Black, brown, purple; paint frequently reflects light; polished after painted; strong or weak, sometimes barely discernible; generally metallic sheen. Design: Interior bowl surfaces, occasionally exterior surface; rim decoration, common; jar decoration, exterior surface only. Geometric patterns crudely executed; arranged in circular order. Lines, solid triangles; narrow lines (rarely), broad lines (common), stripes (common); generally a pendant from the rim. Comparisons: Deadmans Black-on-red, glittering particles are more noticeable; slightly more highly polished; never bumpy; not pitted, rarely crazed; wall thickness less variable; bowls thinner; decoration more neatly executed ; paint richer; narrow lines more frequent, hatching, lines in series, more frequent; usually one to four encircling lines below the rim; solid elements generally smaller; elements usually arranged in angular patterns; curved lines and stripes, rare. Other Names: Red Ware with shiny paint, Pueblo I Red Ware, Pueblo I Black-on-red. Colton, Harold S., and Lyndon L. Hargrave. (1937) Handbook of Northern Arizona Pottery Wares , Museum of Northern Arizona Bulletin 11, Flagstaff, Arizona.